We all experience hurt but often taught to be strong and not cry over spilled milk. Not every situation is “spilled milk” some situations are Rivers and Oceans of pain. People keep so much bottled in their hearts because folks don’t want to hear it. Or is that what we tell ourselves? The time is now to express it all. We express our goals, happiness and material things but we can’t cry, scream or share the fears that lie within. You aren’t alone. Help is there. I’m here. I saw this quote on Pinterest and it is so accurate. We could exercise, buy great clothes, drive good cars yet feel empty. I met a woman who looked amazing from head to toe and could date anyone she wanted to yet, she was depressed. She was Vogue on the outside but Vague on the inside. She often felt alone, it seemed like nothing was going her way. I wish I was able to reach to her and give support but unfortunately, not everyone is open to that. The most I could do was pray for her. Do you or someone you know suffer from depression? Mental Illness is real and the support is there as long as you are willing to take the first step. As you know, I’m big on support and if this applies to anyone, please send me a private message or email. I hope we all can do this. 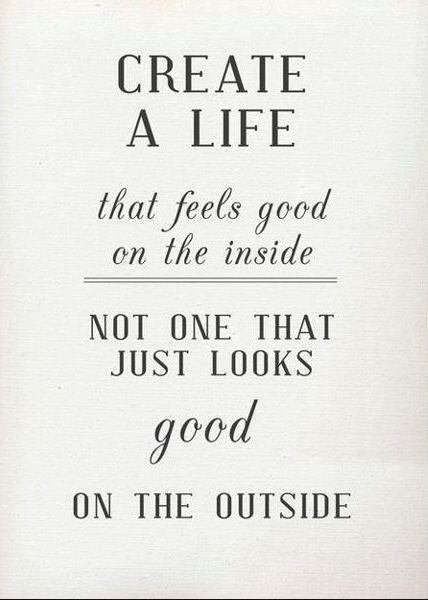 Let’s take a moment each day to make ourselves feel as good as we look! If that means to meditate, yoga, listen to music privately, spend time with loved one then so be it. We have to shine from within.